Janette Harris is Course Leader of Interior Design at the Sir John Cass School of Art, Architecture and Design, London Metropolitan University. 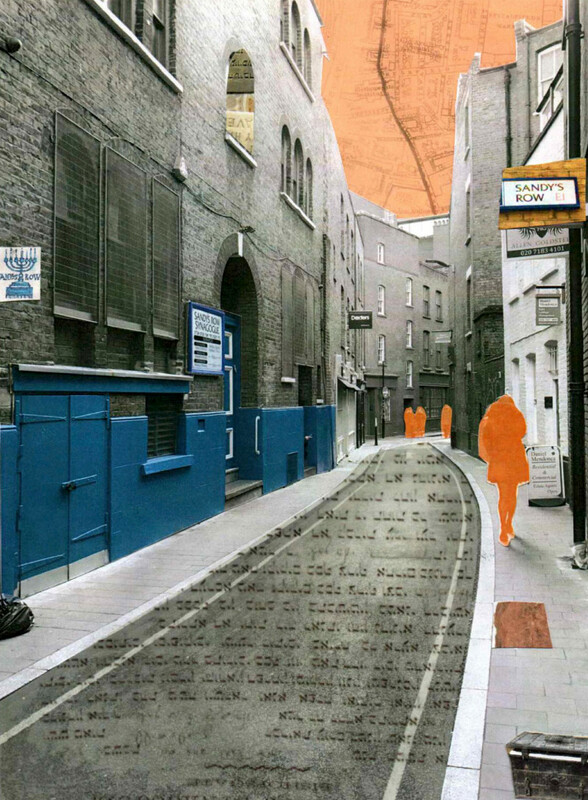 This paper reflects on an approach to a live project undertaken for Sandys Row Synagogue by 1st Year interior students, and how collaborative conditions were created between students and client to enable proposals for the development of the Synagogue’s basement into a cultural heritage museum/educational and event space. The outcomes reveal how the cultural, personal and building history can be revealed and interpreted, through ‘living’ and ‘situated’ practice. This project was tutored by Janette Harris, Kaye Newman, Suzanne Smeeth-Pouras and Karl Harris. This synagogue, similar to many places of communal worship, is looking towards diversifying its premises to allow for private, semi-private and public space for a multitude of reasons, but with an underlying resolve to secure the future, for their community and site. In recent years, archivist, artist and writer Rachel Lichtenstein with Harvey Rifkind, director of the Synagogue, have researched how to breathe new life into the disused basement and celebrate the diversity and rich cultural historical context and building history. This work has included applications to the Heritage Lottery fund. The project, the students’ major piece of work, was conceived as lasting 15 weeks. Given the ambition and potential of the project, a learning and teaching strategy needed to be carefully devised to enable student engagement and skills development, while fulfilling the brief and our commitment to the Synagogue to produce viable schemes. How could the tutors create meaningful tasks to encourage reflection, action and speculation when researching area and site, while embracing the client’s brief? In recent years, Cass interiors Level 4 (1st year) students have been developing a programme that includes live projects and connection to industry. Within the projects it has become clear that reflective practice is an essential and dynamic creative tool that can promote depth and breadth, develop creativity and enable students to analyse space and its context - to understand the ‘seen’ and the ‘unseen interior’. - Secondary research starts to inform and underpin before the primary experience. - Events, research, walking research, primary and secondary research. - Reiteration leading to a deeper understanding. The design of the learning and teaching approaches, to enhance “investigation”, “immersion” and “evaluation”, asked students to form communities of practice. This “situated learning” after Lave and Wenger (1991) and “living practice” after Higgs et al (2011) encouraged students to share and discuss initial research into the historical, political and cultural contexts of the Spitalfields area, the Synagogue and the building. This approach helps to discourage surface learning and encourage the initial research to be a launch pad for deeper and broader understanding, while encouraging the student voice. Once the students found an interest or position, they could undertake their own path of development and discovery; their conclusion and findings were demonstrated as individual outcomes. To document and enable reflection, action and speculation, a week-by-week practice journal became the key document. The journal acted as the vehicle to demonstrate and test thoughts, actions and decisions, enabling the student to speculate through drawings and diagrams, evidencing their process and practice. It further encouraged and developed communication skills, to give the students their own voice. The challenge was to ensure the journal was used as a tool while the immersive investigation was taking place, avoiding retrospective entries. Students were introduced to the site, whereupon they researched the history and cultural context of the area, collectively developing their findings. In 1681 a wooden chapel was built on the former Artillery grounds of Henry VIII. A brick chapel was established in 1766 and converted into Sandys Row Synagogue 1840 [Figure 3]. Today the narrow streets evoke the atmosphere of Victorian London: to the west Liverpool Street station looms large; to the east, Brick Lane diversifying and reinventing itself yet again, this time as a design hub. While the modernised Spitalfields market to the north bustles with food vendors and Fosters-designed market stalls (in stark contrast to the tradition of Petticoat lane market to the South) there is a connection with the Synagogue as it once stored market stalls in the basement. The contrasts of scale and complex cultural/social contexts, provide a richness of hidden personal histories. The basement [Figure 4] has been recently cleared of knee-deep stored and discarded elements. Among the crumbling paper work, fabrics and general debris, were: preserved silks and prayer shawls; a velvet Bimah cover, created and paid for by the local women of the area for Queen Victoria’s Diamond Jubilee in 1897; and a faded Torah scroll. An old sea chest, believed to be circa 1700, with painted birds on the side [Figure 5] hints at the heritage of those who travelled from afar. Grade II listed oak columns and four more recent brick piers support the beams to the exposed ceiling, interrupted by the lagged heating system that asks us to duck and bend our heads to navigate around the space. A crumbling, uneven concrete floor is punctuated occasionally with embedded old buttons and other small items, a legacy from when the market stall holders of Petticoat Lane stored their wares overnight. In the beams, nails and chalk writing are further reminders of this connection, as well as the ramp that allowed easy access for the stall holders from the street into the basement. The challenge posed by the client was how, through research and reflection, could the integrity of the space be maintained, embracing these palimpsests and materiality. One of the first exercises on site was for students to individually voice-record the environmental, sensory and emotional impact of the space, on experiencing it for the first time. These initial impressions and observations were later used as an underpinning for observational drawing, photographic and measured surveys (the latter being a group exercise). These reflections were edited and recorded within the journals [Figure 6]; images were used to support findings, questions and suggest future approaches. “It felt strange talking to myself walking around the space. But later I realised that I would have forgotten that first experience of the basement, the warmth and sense of history… Later when I talked to my friends they all had different experiences,” reported one student. “The walking tour given by Rachel Lichtenstein has been a brilliant source of inspiration for our project based at Sandys Row Synagogue. Part of the brief is to involve the history and demographics of the local area into the cultural space that we design. As much as you can learn from researching and reading there is nothing like hearing someone who is passionate on a subject talk about it. Rachel showed us the area of Spitalfields, Aldgate and Whitechapel as she has experienced it watching it change over decades as she carries out her work as a social historian. Hearing the stories behind the buildings and streets was exciting and meant you can start to imagine how the area might have been different to what we see today”. Further visits were arranged to the Bishopsgate Institute, where Lichtenstein is establishing the synagogue’s archive, for the students to further primary research to develop into meaningful concepts connected to personal histories of the local community. Once again, the students found the exercise to be useful and a source of inspiration for their design work. By week five students had amassed a great deal of information. They were then asked to evaluate and summarise their initial research for the building, area and key interests through a series of drawings and collages, rather than writing dense text [Figures 10-12]. In addition, research of the building through model-making was key to understanding the spatial requirements and opportunities [Figure 13]. “The Sandys Row project has been an incredible opportunity to have an insight into the real world of interior design. It let us experience how a client’s briefing could look in the future and how creative constraints can actually work in our favour.” Student AJ. “This project for Sandys Row was one that pushed me to grow as a designer. Getting the opportunity to work on a live project with such dedicated and knowledgeable patrons of the Synagogue is something that has helped me to build a strong foundation for my future studies and career.” Student MP. The outcomes [Figures 14-16] are a testament of hard work and dedication of the students, who have invested in the client wholeheartedly with the ambition of the project becoming real. The next step is for the Synagogue to choose elements from the projects they would like to pursue and for a group of students to package that up into a proposal.